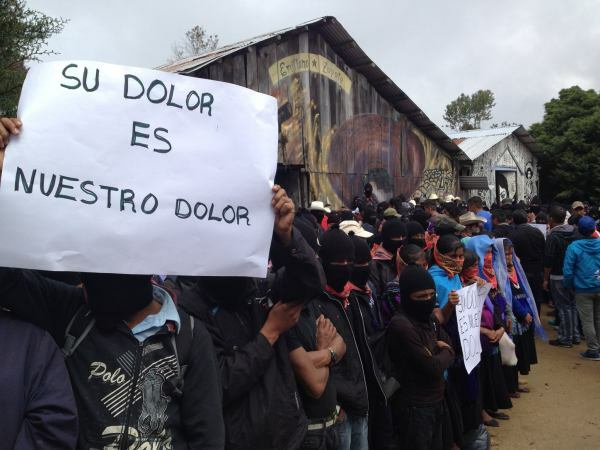 San Cristóbal de las Casas, Chiapas, Nov. 15 – In their visit to Zapatista Territory, parents of the 43 students disappeared from Ayotzinapa Guerrero, agreed with the Zapatista National Liberation Army (EZLN), to articulate a national movement de fondo that questions forced disappearances and extrajudicial assassinations. The meeting took place in the Caracol of Oventic in the [official] municipality of San Larráinzar. Subcomandante Moisés and Comandante Tacho attended. “They embraced our indignation and rage, gave us the best attention and expressed their total willingness to support us,” said Omar García, a student member of the Daniel Solís Gallardo Caravan. Omar García said that one of the objectives of the National Information Caravan is to establish dialogue and agreements with social organizations for the purpose of articulating a movement on a national level with the objective of no longer fighting only for the 43 disappeared, and those extra-judicially murdered on September 26 and 27, but also for the rest, since forced disappearances have become a national problem. María Inés Abrajan, Adán Abrajan de la Cruz’s aunt, indicated that in view of the fact that the authorities are proven to be incompetent, they have lost confidence in them and, therefore, they feel obliged to seek support from civil society and other forms of struggle that permits them to find the whereabouts of their children. For this Sunday, the parents and students of Ayotzinapa have contemplated holding a demonstration in Tuxtla Gutiérrez where social organizations and students from the 19 state teachers colleges that are on strike in protest of the disappearance of the 43 youths would accompany them. [Included in this article are 3 comunicados issued by the EZLN and read at the meeting with the Ayotzinapa Caravan. They can also be found in Spanish on the Enlace Zapatista website, the official web page of the EZLN. We will post the official English translations as soon as they become available.